Here’s a plant you’re not likely to see at the local garden shop. It has few if any leaves, tiny flowers and a tendency to develop spikes at the end of each and every branch. You’d be forgiven for thinking it looks a little untidy and a bit unwell, not to mention just a bit dangerous. 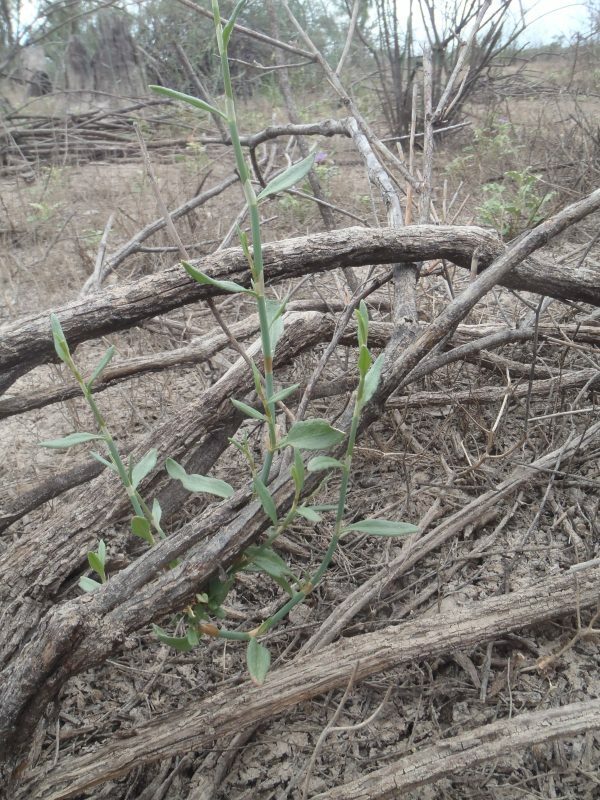 Tangled lignum (Duma florulenta) may not fit into your typical backyard garden, but it’s right at home on the floodplains of arid inland NSW. There, tangled lignum is vital habitat. It forms a platform for ibis to nest on, a thicket for ducks to feed in and protection for smaller birds seeking shelter from the elements and hungry predators. That’s why scientists and water managers are working so hard to ensure this ‘ugly duckling’ of the plant world receives the recognition and protection it deserves. Tangled lignum in flower in south western NSW. Photo OEH. In south western NSW, work is underway to understand how quickly tangled lignum responds to watering, how long those effects last and the impact of consecutive flows. Research is focused on Bottle Bend, a wetland near Gol Gol. The site has been targeted for environmental water on three separate occasions with significant outcomes for plants including Black Box and lignum. The Office of Environment and Heritage is funding the research project which is being undertaken by the Murray-Darling Freshwater Research Centre (MDFRC). An ibis comes into land on a thicket of lignum. Photo: J Spencer OEH. OEH water manager Sascha Healy said the research would help to inform the management of future watering events at Bottle Bend and other sites where tangled lignum is present. “Having the science to back up our observations is important in the ongoing management of environmental water,” Ms Healy said. While current research is focused on Bottle Bend, at nearby Gog Gol wetlands, tangled lignum has shown just how resilient it can be. “Part of the Gol Gol wetlands were cut off from natural flows and floods for more than 25 years,” Ms Healy said. “The combined efforts of local landholders and OEH have resulted in flow capacity being restored and the first delivery of environmental water late last year. “The lignum has bounced back beyond our expectations. It had hung on for years with only rainfall to support it. Now, we’ve seen fantastic growth. And with improved plant condition, native birds have moved in to complete the picture. 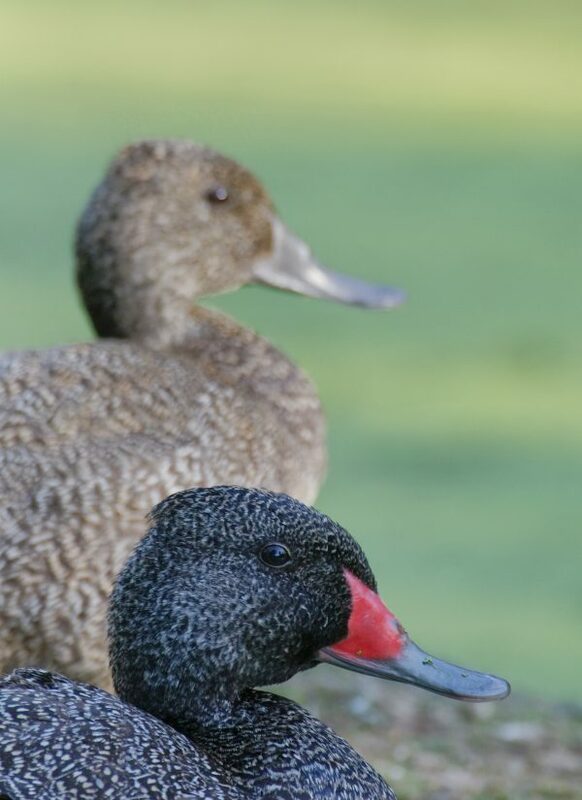 Threatened freckled ducks are making the most of improved habitat conditions near Gol Gol in the state’s south west. Photo: M Todd OEH. “We have threatened freckled ducks feeding on the lignum, ibis nesting in it and a long list of other birds using the lignum for food, shelter and protection. It’s an incredible sight and a great result for everyone who has worked toward restoring flows into the wetland,” she said. Vegetation ecologist with MDFRC Cherie Campbell said researchers had seen a fantastic response to watering so far with lots of new growth, production of leaves and abundant flowering. “This water has also benefited a number of other species such as spike rush, nardoo and water ribbons,” Ms Campbell said. To see lignum in its natural environment, visit Bottle Bend south of Gol Gol, via the Sturt Highway. It may lack the visual appeal of a wattle or gum tree, but lignum provides vital habitat for native birds. Photo V Bucello. Lignum can form extensive shrublands over large areas of inland Australia, including the floodplains of the Murray-Darling Basin. 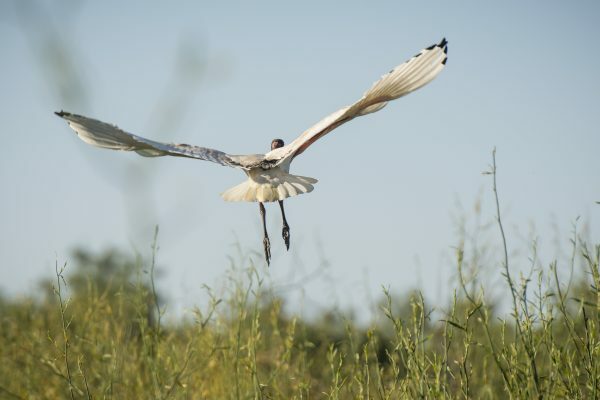 It provides important habitat for colonially nesting waterbirds and, as such, is a priority for conservation under the Murray-Darling Basin Plan. In the eastern portion of the southern connected basin, lignum is most often associated with black box communities on the outer floodplain or wetland depressions and drainage lines. Further west, it is associated with most floodplain woodland communities and also forms extensive shrublands, particularly on the lower reaches of the Lachlan and Murrumbidgee rivers. While lignum may not be the most visually appealing plant, it is very important in terms of habitat. Healthy lignum is a positive sign that environmental managers are getting the watering regime right. Ecologist Rick Webster said Yanga National Park, in the Murrumbidgee valley, was a good example of improved lignum health in response to environmental watering. “We’ve seen clumps of apparently dead sticks grow into large, healthy green bushes when we get the watering regime right,” Mr Webster said. “At the same time, we’ve seen the over-storey and understorey improve, as well as increased diversity in the ground layer. 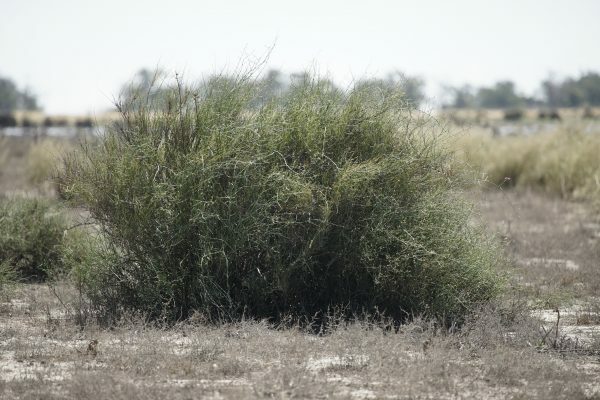 “Depending on your location across the state, the over-storey might consist of river red gum, black box, river cooba or native willow while the understorey may include nitre goosefoot. “The ground layer differs according to the amount of water present, but might include amphibious herbs, floating herbs, floating ferns, rushes, sedges, reeds and grasses. “The lignum itself may consist of small scattered plants or sizeable thickets that provide significant habitat for a wide range of fauna and protection from competition for native herbs and forbs. “Large lignum shrublands are often favoured by ibis for nesting during times of inundation. It’s also nesting habitat for blue-billed and freckled ducks – two threatened species. “Depending on the location and depth of water at a given wetland, smaller waterbirds may also take advantage of lignum habitat including painted snipe, black-fronted and red-kneed dotterels and black-tailed native hens. “Then there are the terrestrial birds using lignum – fairy-wrens, thornbills and honeyeaters. “One of the most important terrestrial species to make use of lignum habitat is the endangered grey grasswren. 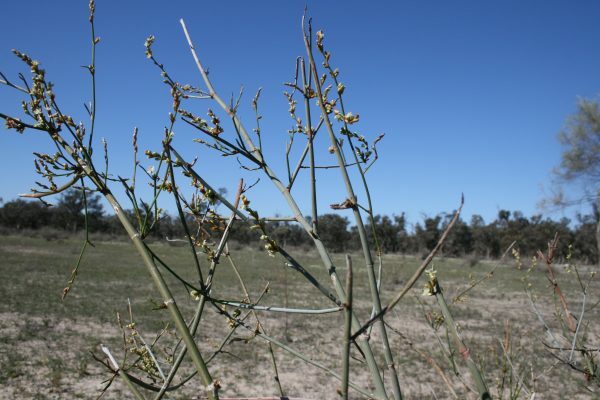 “Within NSW, this species is restricted to the far north-west of the state in wetlands associated with Bulloo River overflow making healthy lignum habitat a high priority for water managers. “So, while lignum may not be the most visually appealing plant, it is very important in terms of habitat,” Mr Webster said.